Figure 1. Schematic representations of the four of the organ systems used for functional coupling. 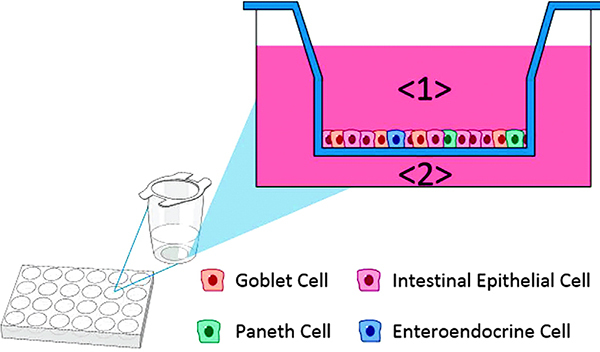 (A) The intestinal module is constructed in transwells from primary jejunum enteroids. Test agents are applied in the apical compartment <1>. The media collected in the basolateral compartment <2> is used to add to the liver. Figure 1. (B) Media from the jejunum intestine basolateral compartment <2> is perfused as a 1:3 jejunum/naïve liver media into the influx port of the SQL-SAL liver model <3>. Efflux media is collected <4> and used to add to two downstream organ models. Figue 1. (C) The vascularized kidney proximal tubule module is a two lumen, dual perfusion system. For the vascular compartment, jejunum/liver-conditioned media <4> is diluted 1:2 or 1:4 with naïve EGM-2 media and then perfused into the influx port <5> to collect effluent from the proximal tubule at <6>. In parallel with perfusion through the vascular compartment, the proximal tubule compartment is perfused with naïve DMEM/F12 PTEC media <6> for effluent collection. 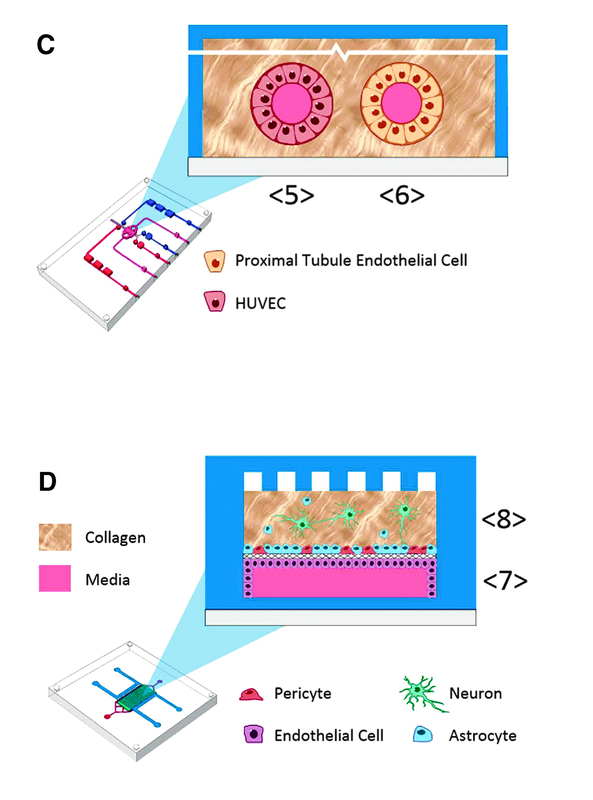 (D) The blood–brain barrier with NVU is constructed in a membrane-separated, two-chambered microfluidic device. 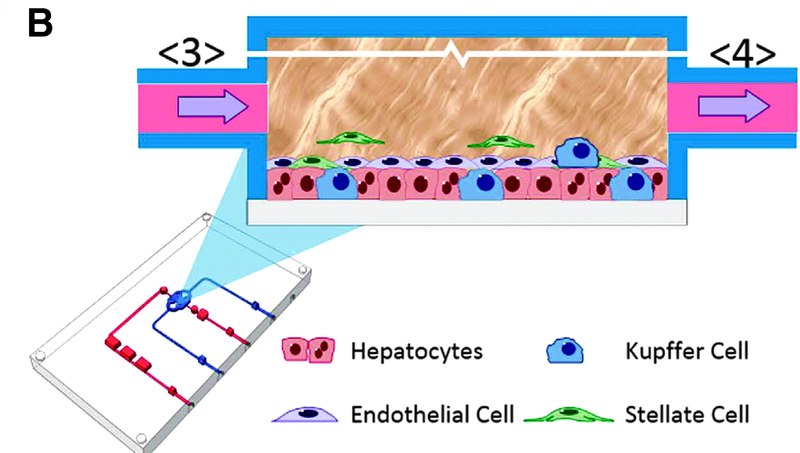 The brain-derived endothelial vascular compartment is perfused at the influx port <7> with jejunum/liver-conditioned media <4> diluted 1:4 with naïve EGM-2 media. The effluent is collected at the efflux port <7>. In parallel with perfusion through the vascular compartment, the neuronal cell compartment is perfused with naïve EBM-2 media at the influx port <8> for effluent collection at <8>. Figure 2. Work flow for functional coupling experiments. Terfenadine exposure is used as an example; TMA and vitamin D3 experiments followed essentially the same workflow. The test compound is initially added to the apical gut media and samples are collected from the apical and basolateral media for MS analysis. Basolateral media samples are sent to UPitt where they are mixed with liver media for exposure in the liver module. Effluent samples are taken for MS analysis and sent to UWash and Vanderbilt where they are mixed with kidney and NVU media, respectively. Samples are taken of the effluent from the kidney proximal tubule module and from the vascular and brain sides of the NVU for MS analysis. Organ interactions resulting from drug, metabolite or xenobiotic transport between organs are key components of human metabolism that impact therapeutic action and toxic side effects. Preclinical animal testing often fails to predict adverse outcomes arising from sequential, multi-organ metabolism of drugs and xenobiotics. Human microphysiological systems (MPS) can model these interactions and are predicted to dramatically improve the efficiency of the drug development process. In this study, five human MPS models were evaluated for functional coupling, defined as the determination of organ interactions via an in vivo-like sequential, organ-to-organ transfer of media. MPS models representing the major absorption, metabolism and clearance organs (the jejunum, liver and kidney) were evaluated, along with skeletal muscle and neurovascular models. Three compounds were evaluated for organ-specific processing: terfenadine for pharmacokinetics (PK) and toxicity; trimethylamine (TMA) as a potentially toxic microbiome metabolite; and vitamin D3. We show that the organ-specific processing of these compounds was consistent with clinical data, and discovered that trimethylamine-N-oxide (TMAO) crosses the blood-brain barrier. 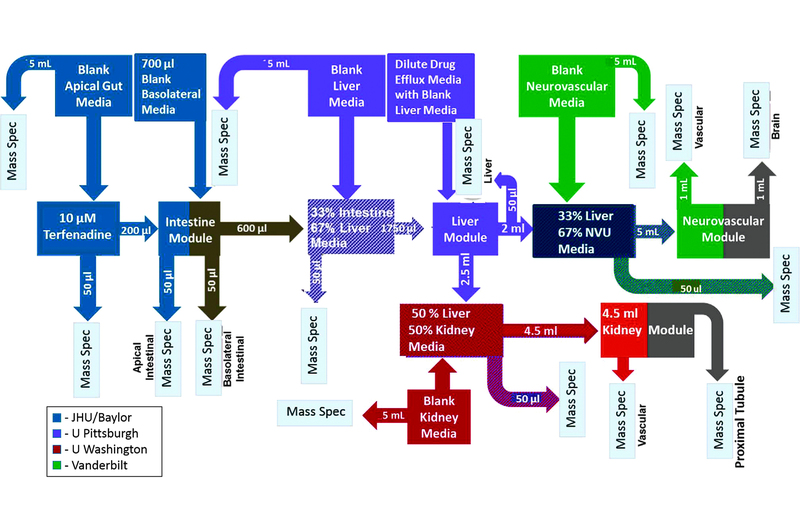 These studies demonstrate the potential of human MPS for multi-organ toxicity and absorption, distribution, metabolism and excretion (ADME), provide guidance for physically coupling MPS, and offer an approach to coupling MPS with distinct media and perfusion requirements. Anton Simeonov, Ph.D., works at the NIH. ASSAY & Drug Development Technologies, published by Mary Ann Liebert, Inc., offers a unique combination of original research and reports on the techniques and tools being used in cutting-edge drug development. The journal includes a "Literature Search and Review" column that identifies published papers of note and discusses their importance. GEN presents here one article that was analyzed in the "Literature Search and Review" column, published in Scientific Reports titled "Functional coupling of human microphysiology systems: intestine, liver, kidney proximal tubule, blood–brain barrier and skeletal muscle", authors is Lawrence Vernetti.